If you live in Munising it would be great big gawdy feathers for Lakers and Coasters. If you live near Lake Gogebic it would be tail feathers for poppers to fish for smallies. There was a time in the eighties, when Metz was producing a very good saddle. These saddle hackles were the perfect woolly worm, woolly bugger hackle. They were long and had a nice long taper in the feather. The usable feather length was between 6 and 8" and they were large enough for up to a size 2 wooly bugger. I still have a couple of these, and while Whiting does market a "bugger Pack," I think there would be a demand for a full saddle for woolly buggers, and large nymphs. Don't bother with trying to create the long short, stiff barbed dry fly hackle, there is plenty of that now. Produce WET fly and nymph hackle. Hen necks and saddles, Larger good quality feathers for Saltwater hackles would be another demand item Most of the "strung" neck, saddle and schlappen hackle imported is very sub standard. I love, love, love using juvinile grizzly hen necks for wet flies. I would really like to find these in different colors (black, brown, ginger, cree, etc). Dry fly quality hackle size 10 and larger. isnt the market saturated with all of the various types of fly tying hackle being suggested?? flytire has a point but I have yet to find a consistent supply of really good tailing hackle feathers. The feathers on the edge of the cape. "If" you have any it's probably only 2 or 3. All makers trim those feathers off the cape before they sell it. Charlie Collins is the only one that will leave them on if you ask for them. Plus he gives you the saddle along with the neck! His chickens are prized but professional tyers in the Catskills. But yeah, unless he specializes in something that is really difficult to source he may find the road a difficult one. Specializing in breeding for Cree would be one suggestion but those are genetic oddities from what I understand. Soft hackle for wets, spiders and flymphs is another good suggestion as stated above...or raise Golden Plover and Moorhen's! Yooper is 13. If he starts now, by the time he's 40, he might be able to have chickens with feathers that are far superior to Whiting and others. I mean, those guys started a few decades ago, and look what they're producing. Yooper might be the NEXT Whiting. Go for it, kiddo. Please realize, however, your hatchlings will only be what they are. If you're going to produce a line of specialty chickens ... it WILL take years, maybe decades. Yeah There’s going to be a lot of work for sure. I’ve been growing up with chickens since I was 6ish collecting eggs doing chores etc. Do you think instead of just selling the cape and saddle do full skins? Study Whiting's operation, I believe he sells everything except the squawk. Necks and saddles are easy to skin and handle, some of the other feathers are best plucked, I think. But before you get to the selling part build that flock up to a hundred or three birds and set up a breeding program to keep only brood stock that has the colors or characteristics you want. Figure out what to do with the meat and offal; uses or sales. Maybe see if you can do an internship with Whiting. You seem like maybe a perfect candidate for something like that. He could teach you a lot, assuming he's willing. Apprenticeship is a great idea. I raise chickens - but hackle only happens coincidentally. Right now we have a small flock (mixed barred rock and Ameracuanas) and two roosters are enough to live with 10 hens. Sometimes you get roosters that will not tolerate another so you have t separate them, with or without hens. Your 22 roosters may require 22 separate cages/coops/areas. And you need hens to resupply and breed the line. And if your Andalusian (black) rooster finds the Buff Orpington (brown) hen you now have a generation of . . . frying chickens. Not trying to discourage you, but to breed for a specific feather color a tyer wants means a dedicated "flock" of just that. You may need many flocks if you want to breed true. There's a neighbor nearby who breeds for show and he has about 10 acres of coops - each within a 20 ft by 40 ft run and isolated by breed. It's a slick operation. 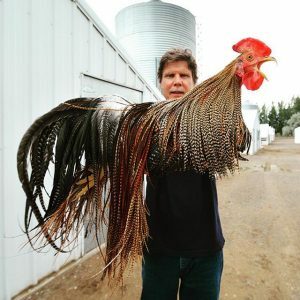 He gets about $30 for one of his bantam Cochin chicks! And he does very well selling eggs or chicks to breeders or folks interested in show quality birds. Right now we have a splendid little Japanese Bantam rooster (he has fairly decent cream hackles down to #22 or so!) and a barred rock rooster (grizzly). The latter is streamer quality - nothing like a Whiting/Hoffman/Metz/Miner, etc. His line was meat/eggs with no thought to hackles. I have no intention of tying with either unless of unforseen death. They're pets and we get enough eggs for ourselves and occasionally for co-workers in the summer. I assume your simply talking about a hobby here and not a career. There is no way your going to compete or produce something new that a business that goes through 80 thousand chickens a year isn't already providing. As Mike said, whiting has taken decades, generations really, to get their business where it is and the feathers produced are still up to the chicken. There is a reason people are selling genetic hackle eggs and not raising them to feather fruition. Now if you want to do this as a hobby to occupy your time while studying, I think it's a great idea and a brood of 22 chickens is perfect. Have fun with it and I hope you share your experiences here but don't let it interfere with your studies.